Description: 32 count Rose Belfast linen by Zweigart from Norden Crafts with Anchor floss and silk ribbon from Thread Gatherer. Stitches include satin, rhodes, smyrna, and stump work. Description: 32 count Peach Ice linen from Lakeside Linens with Anchor floss. Stitches include smyrna, satin and rhodes. Description: 32 count blue linen with Anchor floss. Stitches include satin and smyrna. Description: 40 count Sandstone linen with Anchor floss. Stitches include satin and Kam's coils. Includes number chart for year. Description: 40 count Sandstone linen with Anchor floss. Stitches include satin. Description: 40 count Sandstone linen with Anchor floss and Sampler Threads from The Gentle Art. Stitches include satin and smyrna. Includes number chart for year. Description: 40 count Dirty linen with Anchor floss. Stitches include smyrna, eyelets, double leviathan and over one. Alphabet chart provided for personalizing. Description: 32 count Mocha Belfast linen by Zweigart from Norden Crafts with Anchor floss and Flax'n Colors from The Thread Gatherer. Stitches include eyelets, satin and spiderweb rosette. Includes brass bee. Description: 35 count Irish linen with Anchor floss and Needle Necessities. Stitches include smyrna. Description: 32 count Flax Belfast linen by Zweigart from Norden Crafts with Weeks Dye Works, Sampler Threads from The Gentle Art and Silken Ribbons from The Thread Gatherer. Stitches include spiderweb rosette. Frame by East Side Mouldings. Description: 35 count linen with Anchor floss. Stitches include satin and smyrna. Description: 32 count Vintage linen with Anchor floss and silk ribbon. Stitches include smyrna, eyelets, satin, rice and spiderweb rosettes. Alphabet included for personalizing. Includes 3 brass bees. Description: 32 count crème linen with Anchor floss. Stitches include satin. Includes button form. 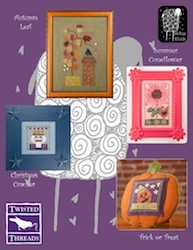 Description: 36 count Barn Owl hand-dyed linen from Birds of a Feather with Anchor floss. Stitches include satin and smyrna. Bee charm included. Description: 32 count Mocha Belfast linen by Zweigart from Norden Crafts with Anchor floss. Stitches include satin. Includes 2 brass bees. Description: 36 count Vatican Red hand-dyed linen from R & R Reproductions with Anchor floss. Stitches include satin and Kam's Coils. Description: 26 count Dirty linen from Norden Crafts, Ltd. With Anchor floss and Sampler Threads from The Gentle Art. 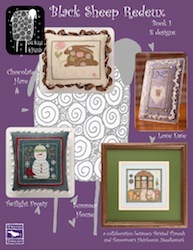 Stitches include smyrna, double leviathan, satin and French knots. Frame by Hog River. Description: 32 count Pealed Barley linen from Lakeside Linens with Anchor floss. Stitches include rhodes and satin. Bee charm included. Description: 32 count Glenshee linen with Anchor floss. Stitches include smyrna. Description: 35 count Mariner's Blue hand-dyed linen from R & R Reproductions with Anchor floss, Weeks Dye Works and silk ribbon from The Thread Gatherer. Stitches include smyrna rna and spiderweb rosettes. Description: 40 count Sandstone linen with Anchor floss and Sampler Threads from The Gentle Art. Stitches include satin. Ladybug button by Just Another Button Company. Description: 18 count Waterlily linen from Wichelt Imports with Caron Collection Impressions, Sampler Threads from The Gentle Art and Crescent Colors. Stitches include smyrna and rhodes. Description: 18 count Dirty linen with gumnut buds. Stitches include smyrna. Description: 32 count Lydia's Lavender from Lakeside Linens with Anchor floss and Weeks Dye Works. Stitches include satin and elongated cross. Description: 32 count Natural Belfast linen by Zweigart from Norden Crafts with Anchor floss. Stitches include satin and eyelets. Description: 32 count Crème linen with Anchor floss. Stitches include smyrna. 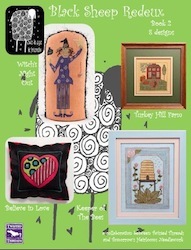 Includes directions for finishing into a pinkeeper and button form. Description: 35 count Dirty linen with Anchor floss. Stitches include French knots and turkey stitch. Description: Any linen with Anchor floss! Description: 32 count Vintage linen with Anchor floss. Stitches include satin, eyelets and spiderweb rosettes. Description: 40 count Sandstone linen with Anchor floss. Stitches include elongated smyrna. Description: 36 count Khaki Edinborough linen by Zweigart from Norden Crafts with Anchor floss. Stitches include smyrna and satin. Description: 27 count Natural linen with Anchor floss. Stitches include satin and Kam's coils. Includes hand-dyed wool from Weeks Dye Works and number chart for year. Description: 27 count Natural linen with Anchor floss. Includes hand-dyed wool from Weeks Dye Works and number chart for year. Description: 36 count uneven weave by Graziano with Anchor floss. Stitches include rhodes and satin. Includes 4 buttons. 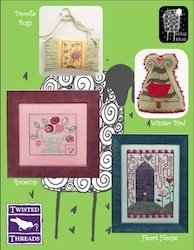 Description: 32 count vintage linen with Anchor floss and Sampler Threads from The Gentle Art. Stitches include smyrna, double leviathan, eyelets, satin and over one. Description: 32 count Wisteria linen from Lakeside Linens with Sampler Threads from The Gentle Art and Crescent Colours. Stitches include smyrna. Description: Anchor floss and Weeks Dye Works. Stitches include satin and smyrna. Description: 40 count Sandstone linen with Anchor floss, Weeks Dye Works and Sampler Threads from The Gentle Art. Stitches include smyrna and French knots. Description: 32 count crème linen with Anchor floss. Stitches include smyrna, satin, eyelets and rhodes. Description: 35 count linen by Graziano from Norden Crafts, Ltd. With Anchor floss and Weeks Dye Works. Stitches include rhodes, smyrna and satin. Description: Two designs on 32 count Summer Khaki Belfast linen by Zweigart from Norden Crafts with Sampler Threads from The Gentle Art and Weeks Dye Works. Stitches include smyrna and satin. Includes 2 button forms and 2 magnets. 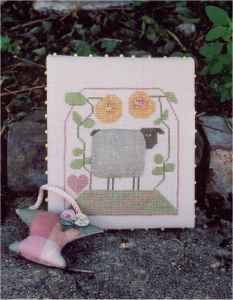 Description: Two designs on Thistle Pink linen from Lakeside Linens with Sampler Threads from The Gentle Art , Crescent Colors and DMC floss. Stitches include eyelets, rhodes, satin and French knots. Includes 2 button forms and 2 magnets. Description: Two designs on Thistle Pink linen from Lakeside Linens with Crescent Colors and Mill Hill beads. Stitches include eyelets. Includes 2 button forms and 2 magnets. Description: Two designs on Meadowlark linen from Birds Of A Feather with Weeks Dye Works. Stitches include rhodes. Includes 3 button forms and 2 magnets. Description: Two designs on 32 count Willow Belfast linen by Zweigart from Norden Crafts with Crescent Colors. Stitches include smyrna. Includes 2 button forms and 2 magnets.